Sutapa received her M.S. in Biochemistry from University of Kalyani in the year 2016 and her B.S in Chemistry from the University of Calcutta in the year 2014. Her M.S dissertation project was in National Institute of Cholera and Enteric Diseases (NICED), and focused on the serine protease VesC secreted by the cholera pathogen, Vibrio cholerae, which stimulated IL-8 secretion from human colorectal adenocarcinoma HT-29 cells by the activation of protease activated receptor 1 (PAR1). 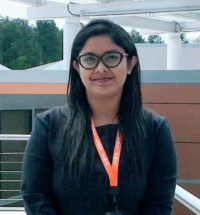 While her one year research work in NICED, pathophysiological and immunological aspects of research instigated her interests, and she joined Dr. Chatterjee’s lab in Fall 2017 to pursue doctoral research under his supervision. Her aim is to work hard and publish good papers to set a brighter future career. Recipient of the prestigious Arnold Fellowship (August 2017- present) from the Department of Environmental Health Sciences, Arnold School of Public Health. Recipient of the DST-INSPIRE Fellowship (March 2017) from the Department of Science and Technology, India. Awarded the Professor J.J. Ghosh Silver Medal (November 2017) for securing the first position in the order of merit in M.SC Biochemistry, from University of Kalyani.